One of the other senior couples here, Elder & Sister Ford, are Church Public Affairs specialists for this area which includes Ethiopia, Rwanda, Uganda, Kenya and Tanzania. Part of their assignment is to keep up the Kenya blogsite and the facebook site. (I think they may keep up blogs for each of those other countries but I haven't checked it out myself). They travel all over the area seeking out interesting and positive news of the Church here in Africa. The blogsite is www.mormonnewsroom.co.ke. I don't know what the facebook site is since I, being the rebellious sort that I am, don't do facebook. Check out this article: http://www.mormonnewsroom.co.ke/article/kenyan-mormon-honored-by-queen-of-england. The story is about the son of a man we work with at the Service Center here in Nairobi. He's so proud of his son, as he should be. His son got to stay at Buckingham Palace for a week! 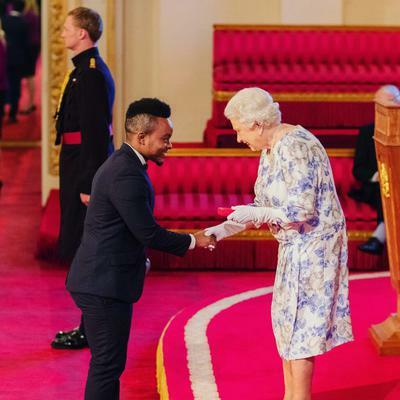 Our friend, James Kyulu's, son receiving an award for "innovation by youth" from Queen Elizabeth. How cool is that?! Too bad James wasn't invited to be there to actually watch it. Oh well. Not too many people get invited to meet the Queen. I think she's a very lovely lady and I've always respected her. She has done a lot of good in the world. And on the same page, there's an article about our new Mission President, President Msane and his wife, Sister Msane. Check out <http://www.mormonnewsroom.co.ke/13353166033189290675>. This picture was taken at our mission office in front of a picture of the Second Coming of the Savior in clouds of glory.